Get 4G LTE high speed data, unlimited talk and text, and nationwide coverage with the Mint Mobile 3-Month 8GB Prepaid SIM Card Kit. 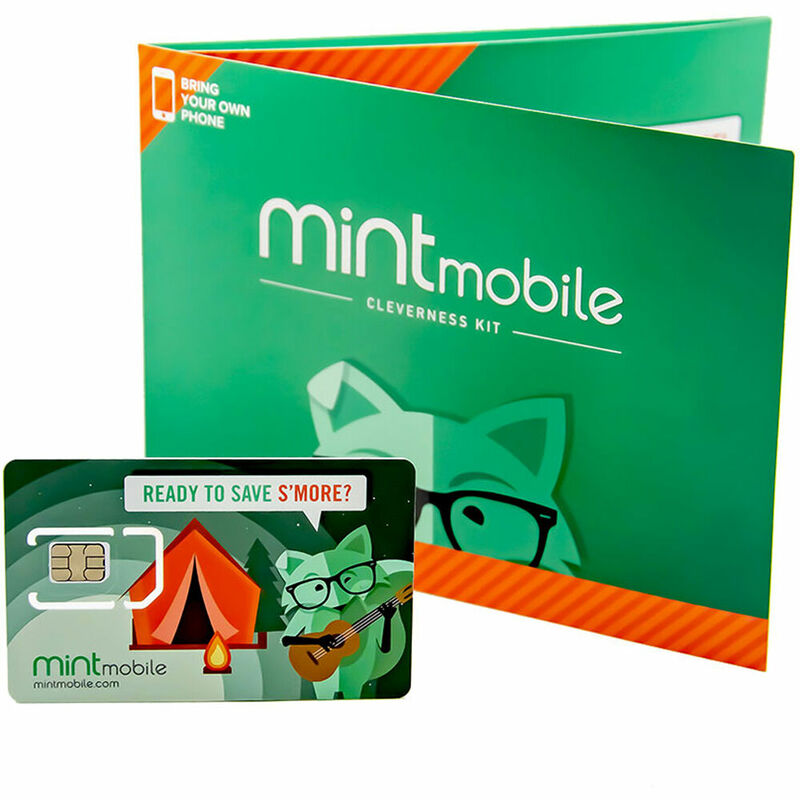 With this Mint Mobile plan, you get three months of wireless service. Mint Mobile is designed to work with most unlocked GSM devices and the SIM card is bound to fit as this kit includes a standard, micro, and nano size SIM card. Additionally, this plan includes free international calls to both Mexico and Canada. After your 3-month plan ends, you can lock in your low intro offer pricing by renewing with a 12-month plan. You'll pay the same $20 per month as before, but this time with no phone bills for a whole year. If you only want another 3 months of service, you can renew at the regular 3-month rate of $35 per month. Box Dimensions (LxWxH) 5.7 x 5.7 x 4.4"
3-Month 8GB Prepaid SIM Card Kit is rated 5.0 out of 5 by 2. Rated 5 out of 5 by cata from nice service, i activated fast simple and easy it come free with my moto x4 so i activaded fast simple and works great with the phone not a glitch, thank you mint mobile! Rated 5 out of 5 by Johnny from Excellent startup kit for a new phone So easy to setup using a browser. Was able to do so from outside the US. A great alternative carrier option for anyone looking for a prepaid plan. Yes. The SIM card must be activated within 45 days of purchase. Yes it will: This plan includes free international calls to both Mexico and Canada. Does this have an expiration date for activation? The SIM card must be activated within 45 days of purchase. This plan includes free international calls to both Mexico and Canada. does the price cover for the monthly subscription fees .. if not how much do i need to recharge each month? This would be for a 3 month period. After your 3-month plan ends, you can lock in your low intro offer pricing by renewing with a 12-month plan. You'll pay the same $20 per month as before, but this time with no phone bills for a whole year. If you only want another 3 months of service, you can renew at the regular 3-month rate of $35 per month. can i use a current phone number and are there instructions on how to do this? Yes, you can port your own phone number to Mint and instructions are provided.